exist@metro July 2014 Leif Gifford ‘Contained Explosions’ from EXIST ARI on Vimeo. Documentation Photographs by Alan Warren. Video by Nicola. Leif Gifford will be presenting a live performance, Contained Explosions. Contained Explosions is the next stage of development in Gifford’s ‘Explosive Tendencies’ series of audio-visual experiments. 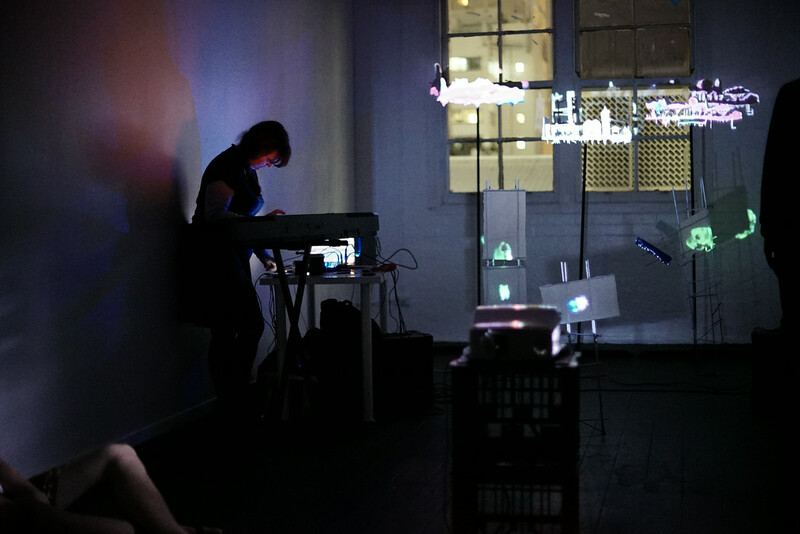 Her performance for Friday Night, incorporates previous sculptural works with her new videomapping processes. Within the immersiv installation, she animates, destroys and rebuilds her memories with cues from live music and projections. Enter Leif’s collapsing and renewing world of sculpture, projection and exploding memories. She invites us into a scribbly, colourful, volatile world inside all of our heads, whilst technically testing the boundaries of videomapping and textile sculpture. Leif Gifford for her exist@Metro performance uses a technique called video mapping. 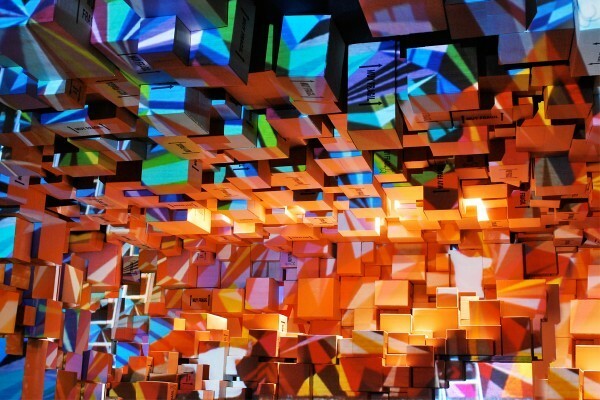 This is a relatively new technique in live video art where projections are mapped to architectural or sculptural structures. Adding audio to the video mapping experience can make the performance like contemporary theatre or being in a live music video. Gifford’s abstractions are well-developed and use drawing as a base, rather than graphic design which is commonly used commercially. As the video mapping software develops so does the artform. What could you imagine Gifford or yourself doing if you could get access to this? Here are some links from VICE’s Creator’s project, where the video mapping process was used similary to ‘Contained Explosions’ on cardboard boxes. Did you catch GOMA’s feature exhibition on performance art?? ‘Trace: Performance and its Documents.” Does this video jog your memory? Essentially in Hinterding’s work your body is completing an extra extra low volatge circuit between the alligator clip and the graphite on the wall, and in Batol’s work your body is completing an extra extra low voltage circuit with somebody else’s body as each of you you hold onto a knob. Technically, you could use two bodies in Hinterding’s work also, but it is set up for solo interaction with just one set of headphones. “Pop on the headphones and then touch the graphite pattern that is painted on the wall. As a naturally very curious person I found this intriguing, and I find that point where science and art meet fascinating. I spent at least 8 minutes touching different parts of the pattern, to see how the sound coming through the headphones was affected. I had a very interesting sensation immediately after taking off the cans. The buzzing continued in my ears for a few minutes, which was very disorienting in the quiet environment of the gallery. While I had been immersed in the artwork with the headphones on, as soon as they came off and I looked away, it was as if I’d just woken from a deep sleep, with earplugs in and I still couldn’t hear anything. 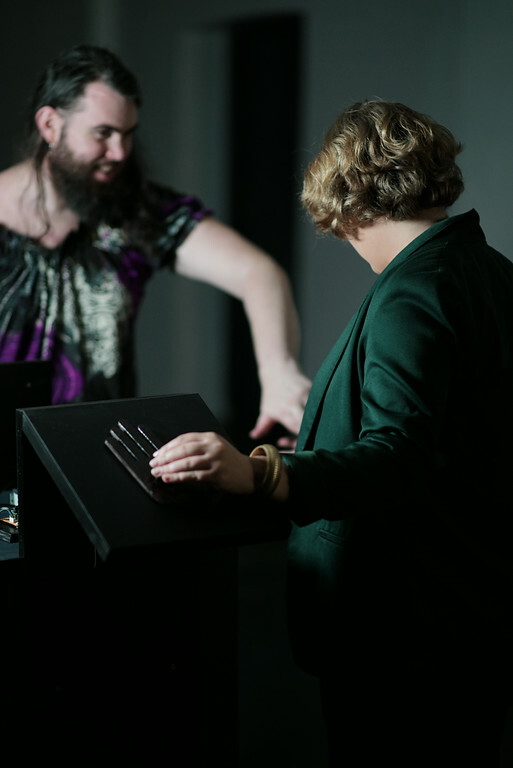 “Batol, a multi-disciplinary artist with intersecting interests across the mediums of intervention, new media and sculpture, will be presenting the interactive installation, Touch Machine. Drawing upon some of Batol’s signature approaches to exploiting technology for unpredicted ends, the work features hacked technologies that provide sonic response to incidents of human touch. What do you think about Alrey Batol’s work?